So-called “McRefugees” have found a clean, safe refuge in 24-hour branches of the fast food chain. AS OTHER DINERS in the McDonald’s enjoyed their Big Macs past midnight early last month, no one noticed the middle-aged woman who appeared to be sleeping at her table. The woman, wearing a grey coat and slippers, abruptly slumped over at about 1.20am, CCTV footage showed. It wasn’t until the next morning that a customer found the woman was cold and unresponsive. Police were called at 8.30am, about 24 hours after the woman first entered the restaurant, according to a report in the South China Morning Post. The death of the woman, identified by police as a 56-year-old surnamed Lai, has focused attention on the growing number of working poor and homeless people spending their nights in McDonald’s. Dubbed “McRefugees”, they sleep in 24-hour branches of the fast food chain, which offer a clean, safe and free refuge found in few other places in the southern Chinese business hub. More than 120 of the company’s 253 Hong Kong outlets operate around the clock. In a statement, McDonald’s Hong Kong said “we welcome all walks of life to visit our restaurants any time”. It added that it tries to be “accommodating and caring” to customers who stay a long time in restaurants “for their own respective reasons”. The phenomenon dates back to at least 2007 and has also been documented in Japan and mainland China. It appears to be particularly popular in Hong Kong, notorious for being one of the world’s most expensive places to live because of sky-high rents. At the same time, homelessness is a growing problem in the city, with the number of street sleepers tracked by the government rising to 806 this year, more than double the amount since 2007, though social welfare groups say the actual number is likely higher. One such person, Mary Seow, began sleeping in a McDonald’s in the working-class Jordan district about two weeks ago after she noticed others doing it. Seow, who was preparing to doze off in a corner of the basement-level restaurant, said she previously had been spending her nights in a park. “Sometimes I’m quite sleepy and I don’t feel shy about sleeping here,” she said. But sometimes I’m not sleepy and I feel quite shy. And I also ask myself why I have to end up in this way. The 60-year-old widow, who arrived in Hong Kong two months ago, said she was swindled by mainland Chinese “friends” she met at a church in Singapore. They persuaded her to sell her house and go with them to invest the money in the mainland, where she spent five years depleting her funds, she said. Now, she lives off her meagre savings and some money from working as what is known as a “parallel trader”, a person who carries diapers, baby formula, chocolate and other branded goods across the border to the mainland. She said she’s not ready to go back to Singapore because she doesn’t want to lose face with friends wondering where she’s been. As she prepared to nod off, three men across the room lay covered by blankets on padded vinyl benches. A staff member used tables to block the entrance to the restaurant section where Seow and the others were sleeping, before turning off its lights for the night. Email “In Hong Kong, poor people are living and dying in 24-hour McDonald's”. 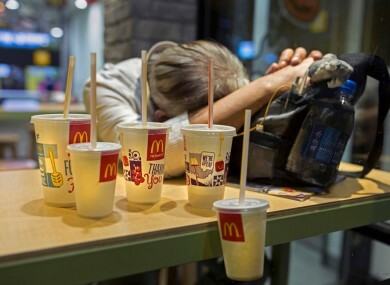 Feedback on “In Hong Kong, poor people are living and dying in 24-hour McDonald's”.